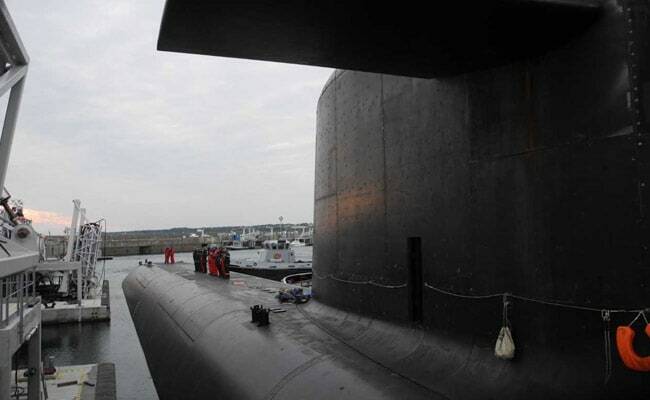 France has become just the third country to bring women onboard it's nuclear powered-subs. "I'm proud to have become part of the submarine family," said Harmonie, a 27-year-old security specialist on Le Vigilant, after returning from her first 10-week mission on the sub. "I'm ready to go out again," she added. France has become just the third country to bring women onboard its nuclear-powered subs, which operate much longer and isolated missions than traditional vessels, after the US and Britain. And officials hope the four women will inspire others to join them. "The navy needs recruits. Today women make up 15 percent of its ranks, they're an asset for us and we want to keep recruiting them," said Captain Christian Houette, commander of the four nuclear-powered, nuclear-armed subs in France's dissuasion force, based on the Ile Longue peninsula near the western city of Brest. The nuclear subs were the last element of the French navy to exclude women, reflecting concerns about the sacrifices required for long missions, as well as difficulties in adapting personnel quarters in such tight spaces. "Some crew members were a bit reluctant, with questions that were largely practical, they wanted to know if it would disrupt their routines: sleeping quarters, bathrooms..." said Mathieu, second-in-command on the Vigilant. Like most crew members, he could give only his first name in line with navy rules. Officials also had to take into account the concerns of sailors' wives, Mathieu added, diplomatically. "In the end, their integration has been extremely smooth. Having proved their qualifications, these women have earned their place aboard in the same way as any other sailor." The Vigilant packs in 110 people whose only contact with the outside world is a 40-word message from family members once a week. The sub keeps radio transmissions to a strict minimum and only the captain knows the destination and other details of each mission -- stealth and secrecy are the watchwords for France's underwater nuclear arsenal. "The thing that's different, compared to a ship, is the one-way link to the outside," Camille, a 29-year-old recruit, said on the deck of the Vigilant. "Two and a half months underwater is possible, and it's exhilarating!" She and the three other women underwent two years of specialised training for their posts. Pauline, the vessel's 31-year-old doctor, had to develop her surgery and dentistry skills to avoid any emergency evacuations which would compromise the mission. "It definitely makes you a little nervous, because you're the only doctor onboard and there's a lot riding on your shoulders," she said. Since they were officers, they already had individual cabins, and besides their own shower, no special arrangements were needed. But getting women on France's other nuclear-powered submarines is not on the cards, since they are much smaller vessels which would be harder to reconfigure for mixed crews. The country's next generation of attack subs, however, are being designed with both men and women in mind. "We're going to progress gradually, taking the time to take the changes into account and draw conclusions," Houette said. And climbing the ranks could prove daunting for female officers hoping to reconcile career and family, since there's little chance of obtaining any long-term base posting. "On submarines, interruptions in the operational command track of more than a year or two are problematic," said Houette. The project is nonetheless moving forward, with the next patrol with female crew members set for the autumn.